The only saw I paid real money for was my 49SP and my 111S with a 36" roller tip in .404 with a real nice Granberg sawmill rig......that one hurt... All the rest I just got right or built them. I think the best deal I got was my 80.......was on ebay with a crushed trigger handle and a rusted up bar and chain.......terrible looking......bought it as a parts saw for my other 80s......long story short.....discovered then and there that all old Jonsereds from the 49SP on up through the 90 used the exact same trigger handle using different trigger linkages for different models, excepting the 621 which has the only odd ball trigger handle. Three hours after UPS delivered the corpse in a cardboard casket that 80 was making chips again.......after replacing the trigger handle with one from a 49sp and putting on a different B&C . It fired right up.....never cleaned the carb or kitted it......never touched the points....nothing I would generally do.....carried 238 lbs of compression...still does....full price delivered......$63.00....it's the one in my sig. I have a half dozen other 80s but that is my favorite!! Yeah, but that 111S you have is a real cream puff.....you just don’t find them like that anymore. Now I see the same 111S’ being passed along from collector to collector with the same missing/broken parts for large money! 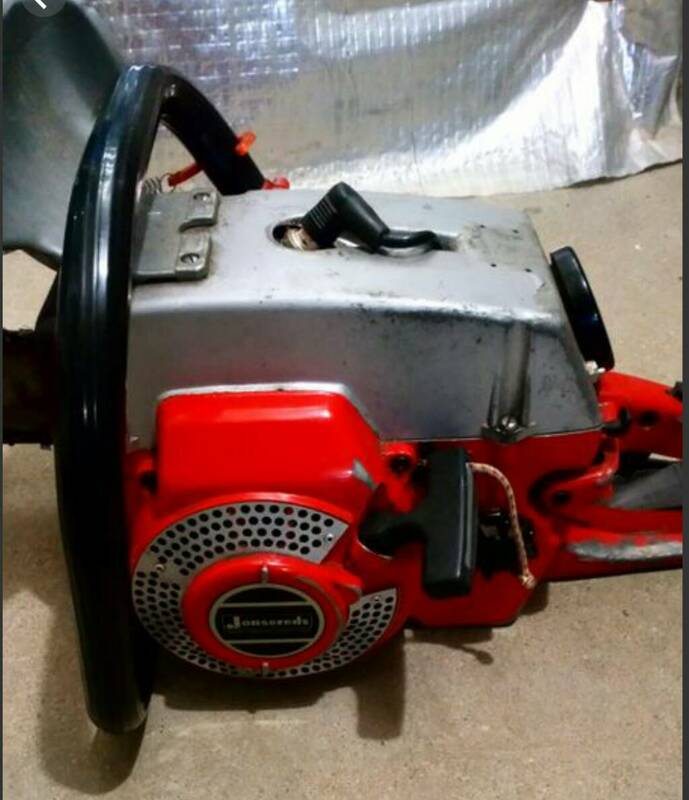 I think all of us buying J’reds a long time have a story like that about a saw we bought cheap on eBay that had an easy fix. Amazing at what point some previous owners give up on saws with easy fixes. I’m sure glad I’m not gettin’ into the hobby now.....the deals are all on Facebook and local sales. I had hoped that something would have come along and truly rivaled eBay by now. The only thing I see is that Ecstasy place and it pales in selection. And as far as Facebook, I’d like to see it go down in flames. Some of these companies have gotten so big that they have a life of their own, with or without their creators.......scary stuff. And don’t even get me started on the big cell phone company holdings. Talkin’ about 5G now with AI.....taking us to the “next level”......next level of what??? The Chinese have invested the most in 5G technology so far....want to be first. They also want back doors in everything so they can spy & steal from the rest of the world....lol! Kensie1988, Real1shepherd and beavis331 like this. You can tell by the remaining silver paint that it's most likely a low hr saw. The silver paint is the first to go and looks really ratty in the old silver tops. That doesn't mean that some knucklehead didn't ruin the saw inside with a poor gas mix or whatever, but going by the remaining paint and originality....looks great! Kensie1988 and Massey like this. You can tell by the remaining silver paint that it's most likely a low hr saw. The silver paint is the first to go and look really ratty in the old silver tops. That doesn't mean that some knucklehead didn't ruin the saw inside with a poor gas mix or whatever, but going by the remaining paint and originality....looks great! So the J’Red 2156 finally got delivered today. Bad omens begin when you see that the bar is hanging out the box. Was in an appalling state. Needed to be stripped (sorry no other pics, was far too embarrassing). The second pick is after 2 hours in a bath and still looking dreadful. One of the grimy and filthiest saws I’ve ever bought. sixonetonoffun, Real1shepherd and Cantdog like this. Wow....! This looks like a saw that was NEVER cleaned. That's awful......hopefully under all the grime somewhere is a decent saw. Ah....consider the grim "paint protection"!!!! president, Kensie1988, albert and 2 others like this. That is a nice looking 80 for sure!!! Good luck with it!! That's true! Pitch and sawdust are very good paint preservatives. My 'Arkansas' 90 was so filthy that I kept it in a box for over a yr. Two days I spent de-griming that saw and getting the varnish out of the fuel tank. Old varnished fuel is bad though and can lift paint, especially inside the gas tank. beavis331, taplinhill, Real1shepherd and 1 other person like this. Boy, that's something you don't see very often on CL anymore, even in my part of the country. I don't think that compression release is as easy to fix as he indicates and the leak in the gas tank itself is a known problem in the design.....also not easy to remedy. Still....it's nice to see one pop up outside of eBay.....although eBay has obviously influenced its price. Might have some interesting provenance. I bet cash might talk some in person. sixonetonoffun and Drptrch like this. So......it came today......I buy bulk lots of Jonsereds NOS parts on ebay every time I can. Generally the outcome is favorable as was this.....haven't itemized the unknown to me parts yet but the well known parts that I've seen tell me I done good!!!! Some very usable NOS 70E parts like NOS plastic fan and a NOS piston kit....a new 910 half wrap and oil pump complete......a NOS top cover for a 920/930 Super with air filter cover.....half a dozen NOS 70E air filters....several 490/590 recoil springs as well as a NOS recoil spring for a 601/751.....lots of AV mounts...some I identify some not........good score overall I would say.....!!! Kensie1988, Zero_sum, taplinhill and 4 others like this. After seeing what they bring on eBay it’s still tempting. sixonetonoffun, Real1shepherd and Drptrch like this. I'd go look at it for ya, but it's clear over the mountains towards the coast...eight hr drive easy, one way. One thing about it...doesn't seem to matter anymore if something is broken or missing......the 111S still bring the big $$ on the bay. beavis331 and sixonetonoffun like this. Individual prices for all that NLA stuff there WAY exceeds what you paid for it. Did you get a SEM's module for the older 70E's? Cantdog and sixonetonoffun like this. Oh yeah.....a lot of very usable NOS parts and some used ones too. Real1shepherd and sixonetonoffun like this. Thanks but no thanks. I have to get some money set aside for the taxedermist. Sometime in March or April he is gonna call and tell me my bear hide is done. And I gotta have the money to pay him. Kensie1988, Real1shepherd and sixonetonoffun like this. Kensie1988, Cantdog, Real1shepherd and 1 other person like this. Kensie1988 and Real1shepherd like this. Is the condenser soldered in, bolted in...have a pic handy?